The wines of France, Italy, Germany and Austria are all considerably unique and distinct. From Bordeaux to Burgundy, the full-bodied blends of the west are in direct contrast to the single variety wines of Beaune. In Italy, each region has is its own character with Piedmont being very different from Puglia. Germany has Riesling for its star while Austria is fast becoming associated with stellar Grüner Veltliner. In the midst (literally and figuratively) of all these fabulous wine countries is one typically over-looked and rarely appreciated by the wine drinkers of the world: Switzerland. Switzerland has a wine history similar to other European countries. Archeological evidence has unearthed grape seeds dating from the Neolithic age (between 3000 and 1800 B.C.) in such regions as St-Blaise and Neutchatel. The Romans too left their mark as did the Cistercian Monks in the Middle Ages, planting the original vineyards of Dézaley in Vaud. In the Medieval Era, the wines were thin and bulked up with the addition of honey. During the mid-19th century, Swiss vineyards suffered under the scourge of phylloxera, powdery and downy mildew. While wine regions in France, Spain, Italy, Germany and Austria quickly recovered, the Swiss wine industry suffered and lost substantial ground. By 1957, the total vineyard land of the country had been reduced to 12,500 ha, (the original figure: 33,000 ha in the 1800s). Looking past the history, the country is notably mountainous with the majority of vineyard land found in valleys and running along lake shores in cantons (i.e. provinces) bordering France, Italy, German and Austria. The föhn, a local wind also contributes to the ripening process of the wine grapes, warming up various portions of the south. The slopes here can also be steep and like in Germany, vineyards are hand harvested. For a cooler wine country, between 45 and 47 degrees north latitude, you can't expect the red wines to be anything like the fruit bombs of California, Australia or Southern Spain. Pinot Noir (Spätburgunder in Germany) is the most widely planted red variety, especially in German Switzerland. Gamay, the grape best known for making Beaujolais is also a staple. In the region of Valais, the two grapes are blended to make Dôle with the Pinot Noir dominating the Gamay. The south western canton produces 40 percent of the wines in the country and has become known as the 'California of Switzerland'. The vineyards here are terraced with some 22,000 smallholders growing the grapes. Provins began as a co-operative in Switzerland in the early twentieth century. Following World War II it evolved into an award-winning firm under the direction of Joseph Michaud with an extensive portfolio of quality reds and whites. The wines range from Syrah to Chardonnay with Dôle playing a part in their product lineup. In France, Pinot Noir is the grape of the Côte du Nuits. Gamay, as I mentioned, is the variety behind behind Beaujolais. In Switzerland, when the two are blended, the offering is unique. If you're looking for something different (which I'm always looking for, I'm getting tired of the Parkerized-wines of the world), then I can safely recommend Provins 2007 Dôle du Valais. First off, expect a floral, red-cherry bouquet with earthy waves of mulch and yes, manure. On the palate, the wine is vibrant, spicy with flirtacious cherry acidity and tasty freshly-picked strawberry notes. The wine is available in your LCBO Vintages section for $18.95. A wine worth discovering. Canadian Thanksgiving is this weekend and of course wine writers, sommeliers and critics are whipping out their editorials, recommending this or that wine to pair with your turkey, your mashed potatoes, yams and cranberry sauce. Lately, I've begun to notice the number of wine writers who are pushing late harvest wines. 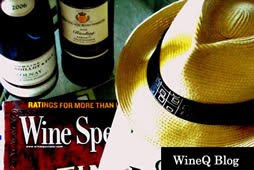 Typically, these Ontario late harvest wines are anywhere between $15 and $25.00 for a 375ml. And it's great to support the local economy (I bought several Ontario wines this afternoon) but it's also nice to find some good value wines. Lovers of German off-dry and sweet wines can look further than Riesling in their Vintages section. Huxelrebe is a crossing of Chasselas (known as Gutedel in Germany) and Courtillier Musqué. For those exploring the world of wine, a crossing occurs when one variety of grape is fertilized with another variety from the same species (in this instance two vines of the vitis vinifera family). Many modern grape varieties are a result of spontaneous crossings in nature such as Cabernet Sauvignon which is a cross between Sauvignon Blanc and Cabernet Franc. In Germany, there are numerous crossings, many of them man-made such as Kerner (Riesling X Trollinger), Morio-Muskat (Silvaner X Weissburgunder aka Pinot Blanc) and the widely planted Müller-Thurgau (Riesling X Madeleine Royale, a table grape). Huxelrebe is grown almost exclusively in the Rheinehessen and Pfalz regions (Bereichs auf Deutsche...) of Germany. The Pfalz (or Palatinate) is where you can find the Weingut (winery) Anselmann along the Southern Wine Route in the peaceful village of Edesheim. Here, the Haardt mountain range, a continuation of the Vosges Mountains of Alsace form a backdrop to the sleepy but verdant landscape. Even though the Pfalz is technically part of Germany's Rhineland, the river is several miles east; no significant vineyards (Weinberge) border it. The Pfalz is more southern than the other regions of Germany. Ripeness is rarely, if ever, a problem. Grapes along with figs, apricots, peaches, kiwis and almonds are grown throughout the area. The Anselmann family have been making wine for over 400 years and like the numerous wineries along the Deutsche Weinstrasse (German Wine Route), grow a wide variety of grapes (including Cabernet Sauvignon and Merlot which can be difficult to grow further north). The Anselmann 2007 Huxelrebe Auslese (AUS-lay-zuh) has won both silver medals at the Vin Agora in Hungary (2009) and Vinovita (2008). At $14.95 in a 750ml bottle it can easily compete and be compared to some of our local late harvest Riesling. But instead of petrol and apple, look for pineapple, passion fruit, honey and banana on the palate. This wine is full-bodied and could easily pair with cheese cake, pumpkin pie and many other Thanksgiving treats.